Caitlin is looking forward to being mentally and physically challenged during basic training. I am the youngest of three kids. My dad is the only one who works in my family and he has been struggling to help my brothers pay for college. I knew I would have to find my own way to pay for college, because my dad couldn’t afford to help. I signed up for the Army Reserve because it will pay for college and I can study nursing, which I want to do because I get to help people and care for patients. I can finish college first before I’m deployed. And as a nurse I’ll be on base and not on the front lines so I’m not worried. My junior year I learned about the Army ROTC (Reserve Officers Training Corps) scholarship. My friend Nile had applied for it. He said the scholarship would pay for college tuition and provide a monthly living allowance. While going to college you’d also do military training on weekends and in the summer for a week. If there was a war, you wouldn’t be called up until after you’d finished school. And you pay the Army back for the scholarship by serving eight years—four years of active duty and four years in the reserves. If you had asked me three years ago if I would consider the military, I would have said no. I don’t like guns. But I thought this would be a really good way to pay for college. And since I’ll be a nurse, I don’t think I will need to use a gun. I went to goarmy.com and requested information about the ROTC scholarship. There’s a list of colleges that have the ROTC program. I found three schools with accredited nursing programs that I wanted to go to (Texas Christian University, University of Portland and UCLA). When I talked it over with my dad, he liked that I would become an officer but he wanted me to be sure that this was what I wanted to do. When I wasn’t accepted to any of those schools, I enrolled at Los Angeles Valley College. Because of overcrowding, I couldn’t get all of the classes I needed. It seemed like it would take three to four years until I could transfer to a four-year school. I was frustrated. I felt like it was going to take until I was 30 to become a nurse. Three weeks later my dad and I met with Zalucki. He gave my dad and me a lot of information about the Reserves. You go through basic training and then you’re a soldier. When you get back from basic training, you go back to your job or school. Zalucki said they can’t pull you out of school to be deployed. Similar to ROTC, you train one weekend a month and two weeks in the summer. Your commitment is eight years but in the reserves, you’re not the first soldiers to be deployed. You don’t go until they need you. He told me that you’re guaranteed admission to participating schools and that the Army will pay for college. My dad asked a lot of questions and looked interested in what Zalucki was saying. He looked like he would be OK with me going into the Reserves. I made up my mind to join the Army Reserve. I felt like this was the best way to go instead of ROTC, because I can get basic training out of the way and still go into a nursing program. I won’t have the stress of trying to transfer and pay for community college. I know my dad is proud of me for going into the Army. Once I made my decision, there was a lot to do. I started filling out the paperwork (it was a lot of paperwork). Then I took the Armed Services Vocational Aptitude Battery test (ASVAB). The test is the military’s entrance exam and it helps you figure out what job will be good for you. It tests you on 10 subjects, including general science, vocabulary, reading comprehension, math, auto shop, mechanics and electronics. After I finished, they handed me an envelope with my score. I was nervous to open it. I was literally shaking, but when I looked I wanted to scream. I got a 44 and needed only a 31 to pass. The next week, I went to the swearing-in ceremony at the Military Entrance Processing Station (MEPS) in L.A. I had a physical and signed the contract. Then I was sworn in. I was really happy. I felt proud and excited about taking this step. On June 6 I get shipped out to basic training at Fort Jackson in South Carolina. After basic training, I plan to apply to colleges, get into a nursing program and get my degree. I am happy now that I’m in the Army, and that I have my dad’s support. My grandfather, aunt and uncle were all in the military. I’m proud that I’m following them. Teens figure out what they’re going to do after high school. Deciding what to do after you graduate is a huge step in your lives. Your teachers are probably telling you to go to college. But what do you want to do? You might wonder whether you’re even ready for college or want to consider working. In this economy are there more sensible options than a four-year university, like community college or the military? Check out how three L.A. Youth writers are trying to determine “What’s next?” in their lives. 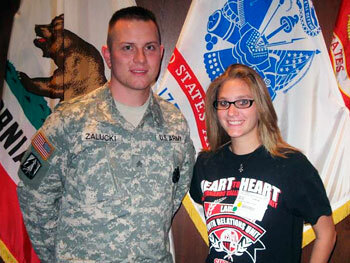 The Army Reserve is going to pay for school so Caitlin can become a nurse.